There is no such thing as a typical PC, just as there is no such thing as a typical car. Although both PCs and cars have common parts, different manufacturers arrange and design PCs (and cars) differently. 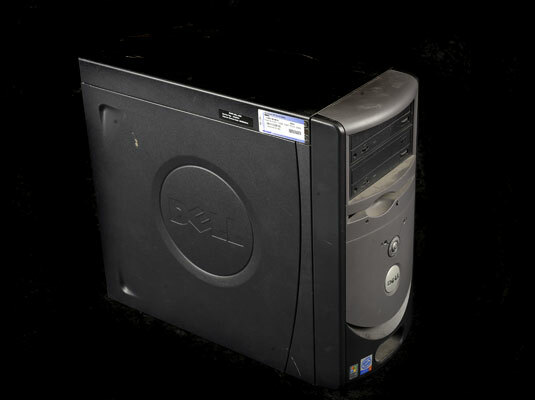 Mini-tower: The most popular PC configuration, where the computer sits upright on a desktop (as shown in this figure) or tucked away out of sight, below the desk. A mini-tower is easy to stow under your desk. Desktop: Once the most popular PC configuration, with a large, wide, slab-like console lying flat on the desktop with the monitor squatting on top (see this figure). Desktop (small footprint): A smaller version of the desktop, like in this figure, typically used in low-priced home systems. The footprint is the amount of desk space the computer uses. Tower system: Essentially a full-size desktop standing on its side (shown in this figure), which makes this PC tall, like a tower. Towers have lotsa room inside for expansion, which makes them the darlings of power-mad users. A tower typically sits on the floor, often propping up one end of the table. Notebook/laptop: A specialty type of computer that folds into a handy, lightweight package, ideal for slowing down the security checkpoints in airports. Laptop PCs, like the one in this figure, work pretty much like their desktop brethren.